There are voices that sound unearthly, heavenly. Victoria Ivanova possessed such a voice of angel. But her angel was flying on the wings of extraordinary vocal mastery. Ivanova's special secret lied in her ability to hide the art - by art. For her the highest standard of the vocal skill was the state of bliss that the artist experienced and was supposed to impress on a listener. Victoria Ivanova was born in 1924 in Moscow to a family of military doctor. Graduated from the Gnessin Special School of Music where she studied piano, then Gnessin College of Music where she studied under the tutorship of O.F. Slavinskaya-Fedorovskaya and eventually from the Gnessin Institute of music including the post-graduate courses. Since 1951 she was a soloist of the Moscow Philarmonic Society. Victoria Ivanova died in 2002. Even when she was a student of music in 1946 Ivanova began making recordings on the radio. She gained wide popularity in the country. Her voice on the radio became a voice of the whole epoch of 1950s - 1960s. Ivanova acquired her own audience of grateful listeners and they still remain her admirers. Ivanova's vast repertoire included Russian and European baroque, classical and romantic music. She sang Beethoven, Schubert, Schumann, but also Mahler whose music was not often performed in the Soviet Union. With great triumph she sang a vocal part of Mahler Symphony No 4 in Paris. 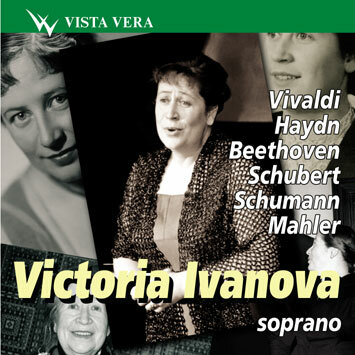 This CD represents only a small part of Ivanova great legacy. But it brings a great satisfaction to see that her art is reappearing again after some years of near oblivion. Ivanova's partners in these recordings were her accompanist G. Zinger, instrumental ensemble under the direction of Adolf Gotlib, Alexei Liubimov, and piano trio - Alexei Liubimov, piano, Oleg Kagan, violin, and Natalia Gutman, cello.